Today, January 19, is National Popcorn Day. We, the Colorado Traveling Ducks, love popcorn. With butter, of course. In the early 16th century popcorn was used in headdresses worn during Aztec ceremonies. Early Spanish explorers were fascinated by the corn that burst into what looked like a white flower. Popcorn became popular in the United States in the mid 1800s. By 1900 horse drawn popcorn wagons were going through the streets of Chicago. Of course, you cannot go to the movies without buying and eating hot buttered popcorn. We, the Colorado Traveling Ducks, love eating movie popcorn with lots of butter. Yum! 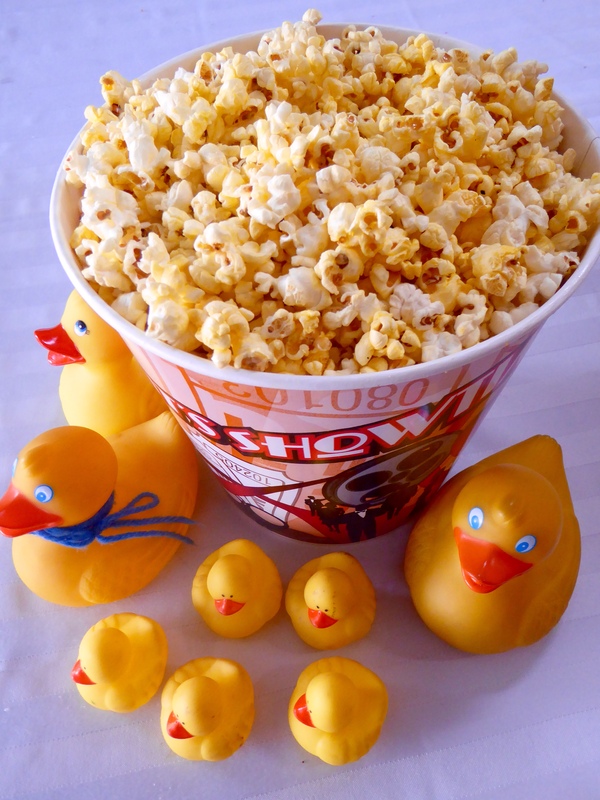 This entry was posted in Holidays, Uncategorized and tagged Colorado Traveling Ducks, National Popcorn Day. Bookmark the permalink. Popcorn is actually a necessity ! Popcorn is one of the few foods I’m really not fond of, so you can have my share! I will gladly eat double portions of popcorn. Thank you! I believe you are the first person I know that does not like popcorn. Thanks for reading and commenting. Yum! Thanks to you and your sister. Don’t want to imagine a world without popcorn. Enjoy your new box. Thanks for reading and commenting. I’ve always had a love-hate relationship with popcorn. Used to dislike it even though I am a big movie watcher and then started liking it a little. I couldn’t imagine a movie without popcorn. We always purchase the largest size and many of our theaters offer a free popcorn refill on large sizes. So they we have more popcorn at home for several days. Of course, extra butter is also a necessity. Thanks for reading and commenting. And enjoy some popcorn at your next movie.